Just when we thought we’d finally gotten over the Galaxy S10 Series, Samsung went and dropped another awesome range of phones into our laps. Yes, the Galaxy A range - the newest family of smartphone’s from Samsung is here and to celebrate, we thought we’d get up close and personal with the new mid-range Galaxy A80, which boasts some seriously spectacular specs. Some new handset colours can be a little hit and miss – but not these. We were mesmerised by all three shades: Black, Pink and White. We’d happily rock all of these colours. This really is one beautiful phone with its premium glass design with a metal frame. It also feels good to hold and offers great grip when taking photos. And while we’re on the subject of taking photos, the biggest design feature has to be the pop-up camera, which runs seamlessly and gives the phone’s design a really futuristic feel. We approve. No, you’re not seeing things – the screen on the Samsung Galaxy A80 is an edge-to-edge 6.7-incher - so there’s loads of display to lose yourself in your favourite films, TV shows and games. And it’s all screen. That’s right, the A80 is the first Galaxy with no front-facing camera notch - offering a perfect stage and canvas for you to explore. We’re talking every single pixel, packed with detail that draws you in and colours that jump off the screen. You won’t think twice about hitting that ‘next episode’ button. And if that wasn’t enough, the screen is optimised to handle multitasking so you can chat away to your mate and watch YouTube clips at the same time. Sssh, they’ll never have to know. This camera’s a big deal. 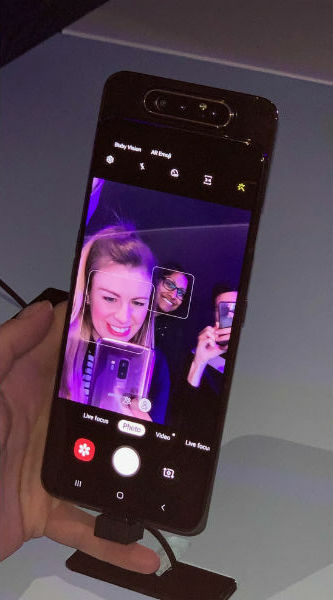 Not only is it Samsung’s first ever pop-up camera device but its rotating triple-lens system means that your selfies will have the same stellar quality as the photos you snap with the rear. We tested it out ourselves in a few different locations and can confirm the results are just as good in low-light settings. The main 48MP sensor is the default camera when you open up the camera app – but it’s super easy to switch between it and the 8MP ultra-wide camera – which is ideal for big group shoots or landscape photos. 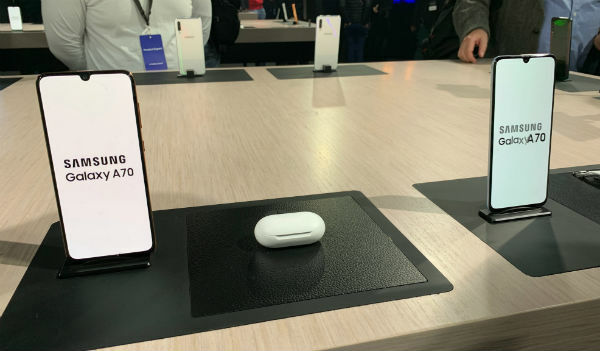 The third camera is a 3D depth sensor - which takes photos with a professional blurred background and live focus videos that give off an artsy cinematic feel. You couldn’t ask for a more convenient way to unlock your phone than the A80’s on-screen fingerprint scanner. It’s a one-touch experience that doesn’t compromise the phone’s design in any way or take up any of that precious precious screen. It’s also super secure so you know the only person who’ll have access to your new A80 is you. From gaming sessions on your commute to catching up on box sets while you wait, the A80s Intelligent Battery adapts to your routine and automatically saves power to make sure you can get through your day. This battery knows exactly what it’s doing. What’s going on inside the A70? Life’s busy – so it’s hard to keep focused at times. Samsung gets this, which is why the Intelligence Performance Enhancer cleverly learns how you use your phone, predicts what you’ll do next, and then optimises it to help you do what you love, quicker. A prime example of this is launching your social media apps once you’ve taken a photo on your camera. This phone knows learns exactly what you’re about. This beauty – and yes, it is a beauty as you can see - has a similar dual-glass build with metal design (obviously without the pop-up camera) as the A80. That doesn’t mean this phone doesn’t have an impressive camera though. The A70 also houses a triple-lens camera, giving you the freedom to capture crystal-clear photos any time, day or night. There’s a main 32MP camera, and the Depth camera can be used to take gorgeous portrait shots that give your subject complete focus in the frame. Then, you can get an ultra wide field of vision (even wider than the human eye) with the A70’s ultra-wide camera. You’ll be able to shoot video that captures a whole lot more. It’s a clever camera too. No, literally the Intelligent Camera software automatically finds your best photo – and gives you a heads up when the shot you’ve taken isn’t perfect. Just like the A80, the Galaxy A70 are fully protected with Samsung on-screen fingerprint technology. You can relax knowing that everything on your phone is safe and accessible for your eyes only. And although the A70 might be a smidge thinner than the A80, it has a slightly larger 4,500 mAh battery, which is capable of 25W fast charging. So, what do you reckon? Has the new Samsung Galaxy range sparked your interest? Well, keep your eyes peeled because the new Samsung Galaxy A range will available to pre-order at Carphone Warehouse soon.